In a large skillet, sauté the onion, bell pepper and garlic in oil until tender, about 3 minutes. Add the lentils, chili powder, cumin and cilantro/oregano (if using). Cook and stir for 1 minute. Add broth. Bring to a boil. 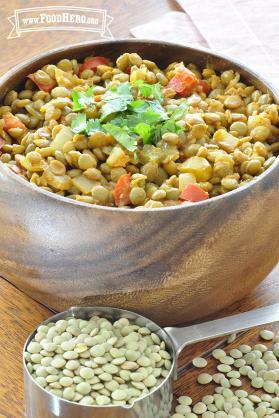 Reduce heat, cover and simmer until the lentils are tender, 20 to 30 minutes for brown lentils, Add water if necessary to keep the lentils just covered with liquid. Uncover; cook until mixture thickens and most of the water is gone, 5 to 10 minutes. Use for tacos, wraps or salad. 1 Comments for "Lentil Taco Filling"